The wooden Ponte dell’Accademia, with its single arch over the canal, has excited argument among Venetian and foreign aesthetes ever since it was built in 1932, replacing an iron bridge that was not much older, called the 'English Bridge' by Venetians who saw it as an aberration of the Industrial Revolution. 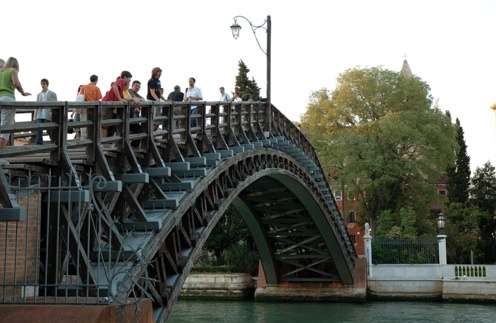 The bridge links the sestiere San Marco to Venice’s great art museum, the Galleria dell'Accademia. It made a brief appearance in Casino Royale (2006).